Its been too long since I did a Project Cassandra update (or any regular posts but on that one, ssshhh) for the simple reason that the game went back to the drawing board quite heavily after the first (and so far only) playtest. That session identified a fatal flaw in the system, simply put tasks were either impossible because characters lacked a given skill or too easy due to the combination of sufficient skills and the premonition abilities. Originally the system had been designed as a fork from that of Lady Blackbird, with players building a dice pool from their available skills. The major difference, however, is that each character in Lady Blackbird has a pool of dice they can draw from to add to rolls, thus even unskilled characters can potentially still roll a large number of dice. In replacing that with Premonitions, which allow rerolls of dice, I’d severely limited the potential of players to complete goals when they lacked the right skills. Having spent a fair amount of time considering the matter the system has been completely overhauled. All rolls are now made from a fixed pool of 5d6 with the number of skills available setting the range on the dice which count as successes. For example if they have only 1 applicable skill then only 1’s count as successes, 4 skills and 1-4 all count as successes. 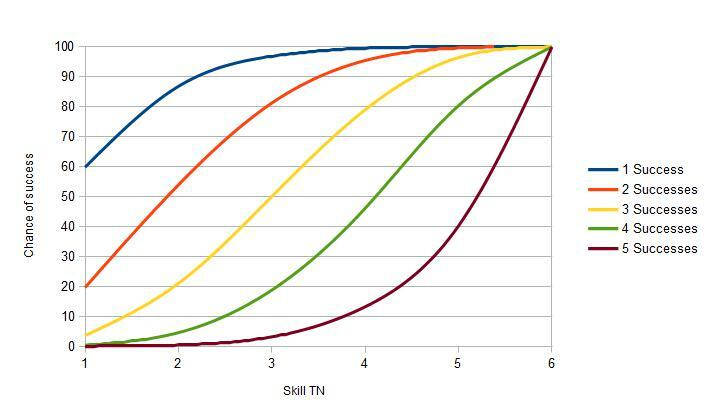 Having already fallen foul of probabilities with the first version of the system I’ve made sure to do a bit of maths this time round and as is apparent from the figure the curves are much nicer this time. The difference though is that even with a low number of skills it’s still theoretically possible to achieve a high number of successes, even before accounting for the Premonition ability. There’s also the added bonus that with it being always being possible to succeed at hard tasks players will be encouraged to spend their premonitions more frequently. With that major hurdle out of the way the second issue to resolve was that of the skill trees. In order to ensure a player always has something to roll each tree now starts as either MENTAL, PHYSICAL or SPECIALIST before breaking down into the specific skills. With those changes, plus some rewording of the skills themselves the game is pretty much ready for another playtest session which can be worked around the writing of character bio’s plus the rules pages. As a child of the 1980’s I didn’t personally experience much of the Cold War. Sure I knew of it but it was really a peripheral thing that had happened in the past or was happening Somewhere Else (and despite having a parent in the military that went on tour during the late 80’s I never connected that with a sense of threat). About the only major Cold War event that I really remember before the collapse of the USSR was the fall of the Berlin Wall. Yes that’s a nuke. That was dropped on America. By accident. Working on Project Cassandra has, therefore, required a lot of research into the earlier events of the Cold War in order to gain a wider understanding of what drove the war for so many decades. Not unsurprisingly fear, hate and jingoism played a large part. World War II had demonstrated just how low we, as a species, could fall and now the populations of both sides were being told the new enemy was even worse. It’s no wonder that people were paranoid. Focusing on specific events however two got my attention recently, both directly connected to the threat of nuclear war that hung in the air for so long. The first was new information from recently declassified documents relating to the accidental release of two hydrogen bombs in early 1961. The accident occurred when a B-52 broke up over Goldsboro, North Carolina releasing the two M39 hydrogen bombs it was carrying. 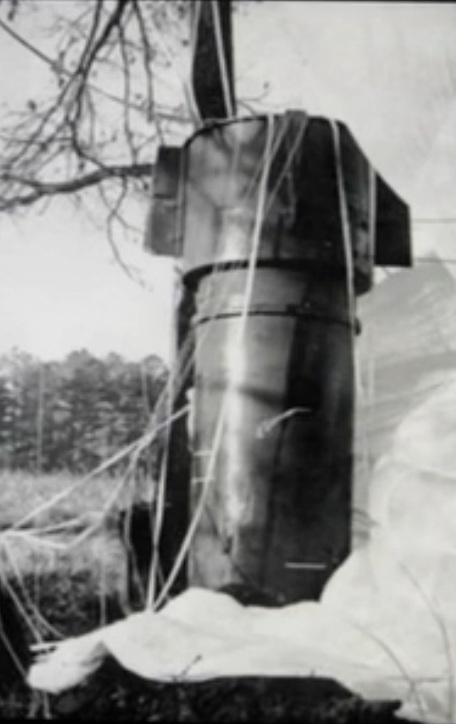 Each of the two warheads carried a nuclear yield over 250 times that which was deployed at Hiroshima but at the time the authorities stated that there was never any danger of detonation due to the presence of multiple failsafes. The recently released information significantly changes that story, indicating that for one of the bombs of the six triggers required to fully arm the bomb only one had not accidentally activated. A single switch was all that had prevent detonation of a weapon with an estimated 100% kill zone of 17 miles. Had it gone I wonder if its detonation would have led to some sort of nuclear strike against the USSR, the US forces would have had little time to realise what had actually happened and nuclear doctrine was heavily weighted towards the need for quick and decisive action. The second event that has specifically got my attention is, thankfully, a much more positive story though again it demonstrates how close the world came to accidentally finding itself in World War III. Stanislav Petrov was an officer in the Soviet Air Defence Forces, responsible for monitoring data coming in from early warning satellites. On 26th September 1983, during a period of strained relations between the Us and USSR (triggered by the USSR shooting down a South Korean passenger jet), Stanislav’s computer systems detected the launch of an American missile, followed up by four additional launches. If he had followed protocol Stanislav should have notified his superiors of the launch. Instead he waited, suspicious that the alert was the false alarm it proved to be. When confirmation from other early warning systems did not arrive the launches detected were put down to malfunctions in the computer system. It’s unclear how close the world came to nuclear war that night as following protocol a retaliatory Russian strike would have required confirmation of an American launch from two independent sources. However, given the tensions between the respective nuclear blocks and strain on the Russian system at that point in history it could have been easily decided that a single source was sufficient and the world as we know it would have been very different. Both of these stories highlight the sort of fears that I want the players of Project Cassandra to face while trying to save the President. I want them to feel like the fate of the world might hang in the balance of their actions and be aware of the paranoia that permeated through the world during the second half of the twentieth century. The fear of all out nuclear warfare is something that the world has done it’s best to collectively forget about but for the game I’m writing, intrinsically linked to the Cold War, it’s something that should always be their, even if it’s just that niggling fear at the back of the mind.